Despite opposition from the majority of Americans to any form of immigration reform that does not include strengthening border security and law enforcement before legalization, immigration special interests are now publicly claiming such an amnesty deal is close in Congress. 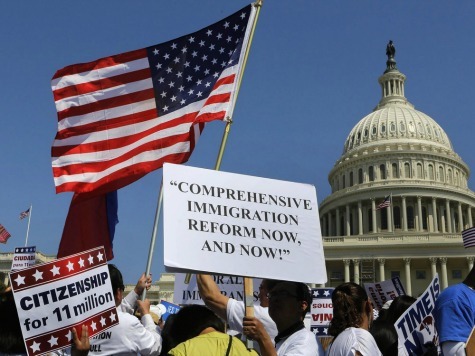 In her article, Needham quotes several different special interest groups advocating for amnesty for America’s 11 million illegal aliens, including the Business Roundtable, the Chamber of Commerce, the National Association of Manufacturers (NAM), the National Council of La Raza, and the Service Employees International Union (SEIU) as all working together to push for amnesty. “We believe strongly that fixing the immigration system makes for a healthier American economy and must attract individuals from around the world,” Matt Sonnesyn, director of research for the Business Roundtable, said. NAM vice president of human resources policy Joe Trauger said the special interest groups are focused on helping corporations, not American workers. “We have to have a system so people to come in and work as market demands it,” Trauger said. Needham also noted how immigration has created alliances between these different special interest groups because they all get something out of the end product. A GOP congressional aide told Breitbart News though that despite any appearances of bipartisanship, the failure of all of these special interests to stand up for American workers is a serious problem. “What’s being undertaken here is not remotely patriotic,” the source said.